Novartis will have to wait even longer to get a verdict on its legal challenge to India's patent law after the country's Supreme Court postponed the hearing of the case once again until September 11. The long-running dispute – whose first legal salvoes were fired in 2005 - focuses on Novartis' cancer drug Glivec (imatinib) but has far-reaching consequences for both the pharmaceutical industry and patients. It has already been postponed by the Supreme Court several times. At the heart of Novartis' challenge is a clause in India's patent law known as Section 3(d), which does not allow a new form of a drug such as a new crystal structure to be patented unless it confers some form of improvement - a "therapeutic advantage" in the language of the law - over the original substance. Novartis maintains that the crystalline structure of the mesylate salt of imatinib which is used in Glivec was a critical development for the product, improving its bioavailability and allowing it to be delivered effectively and safely in an oral dosage form. India's Intellectual Property Appellate Board (IPAB) took a different interpretation, however, and in 2007 concluded that imatinib mesylate was a new form of a known substance and did not provide any significant advance over the older form. The decision was hailed by non-governmental organisations (NGOs) such as Medecins sans Frontieres, which has long argued that the consequences of a Novartis victory in the case would be severe restrictions on access to affordable medicines in India and across the developing world. Meanwhile, a landmark case involving Bayer's cancer drug Nexavar (sorafenib), which had its patent protection stripped away under the first incidence of 'compulsory licensing' of a drug in India, has also been postponed. The IPAB had been due to hold a hearing on the compulsory license - which allowed a generic version of Nexavar from Natco Pharma to be introduced at fraction of the price - this week. However, it has now been postponed to September 3. 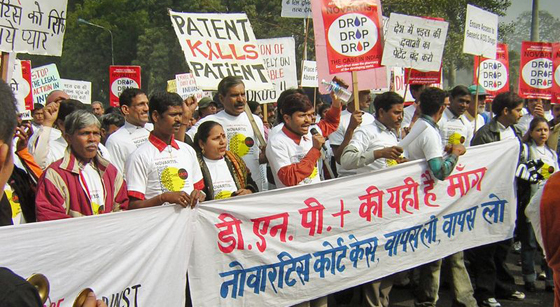 This case has sent shockwaves around the pharmaceutical industry as the Indian Patent Office invoked the compulsory license on the grounds that Nexavar was too expensive, in other words it was not being offered at a "reasonably affordable" price to the Indian public, who were being denied access to the drug as a result. Natco's generic sells for $175 per month, a 97 per cent discount to the $5,500 charged by Bayer for Nexavar, according to MSF. In turn Bayer receives a 6 per cent royalty on Natco's sales. Both verdicts are viewed as critical by the pharmaceutical industry, as India and other emerging economies are being targeted by many of big names in the sector as growth in established markets stalls. On the other hand, opponents argue that India's position as the 'pharmacy of the world', thanks to its strong generic industry, will be undermined by a more stringent interpretation of intellectual property rights.